The Park Is Home To Numerous Carnivores Including Leopard, Wild Dog, Jungle Cat, Civets Hyena, Jackal, and Tiger. 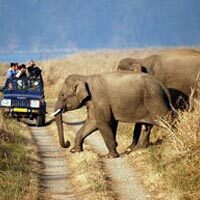 These feed on species such as Sambar, Chital, Nilgai, Chausingha, Wild Boar and Langur. Sariska is also well known for its large population of Rhesus Monkeys, which are found around Talvriksh. The avian world is also well represented with Peafowl, Grey Partridge, Bush Quail, Sand Grouse,Tree Pie, Golden backed Woodpecker, crested Serpent Eagle and The Great Indian horned Owl. Once an ancient Rajput state, formerly known as Mewat, Alwar was nearest to the imperial Delhi. The people of the state did not accept any external interference's and daringly resisted against foreign invasions. In the 12th and 13th centuries, they formed a group and raided Delhi. But finally Sultan Bulban (1267 A.D. - 1287 A.D.) suppressed them, bringing the area under the Muslims rule. In 1771 A.D. Maharaja Pratap Singh, a Kuchhwaha Rajput belonging to the clan of Jaipur's rulers, won back Alwar and founded a principality of his own. Jeep safaris in the Sariska Tiger Reserve will cost you around 300 Rs per head and these safaris will comprehensively cover almost all parts of the tiger reserve accessible by these heavy duty vehicles. Jeep safaris in Sariska Tiger Reserve are normally provided twice a day, and you can opt for these safaris in order to catch a glimpse of the wildlife. 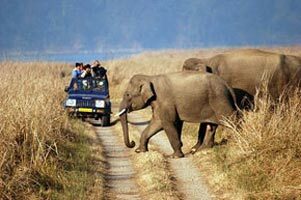 Safari rides are accompanied by the forest department guards and the vehicles are protected with grills.